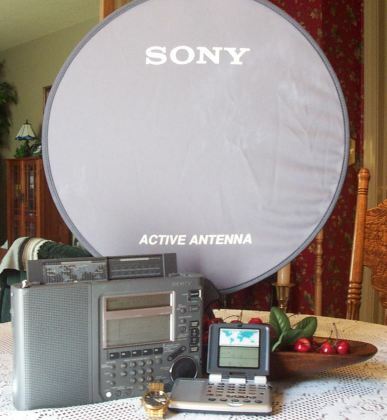 For several decades Sony has been a pre-eminent name in world band portable radios. The current flagship SW77 was introduced in 1991 and the SW07 became available in 1999. It’s interesting that these two radios share such similar-sounding model designations as they represent two opposite extremes of portable radio design. So what are the similarities between the tiny pocket-sized SW07 and the larger “lap portable” SW77? Let there be no doubt…each represents ‘best in class” performance among comparably sized radios. They are both double conversion, very sensitive, selective receivers. Each has Sony’s legendary sync circuitry, which can sometimes drag a listenable signal out of a noisy quagmire. Each has more than adequate memories for any reasonable purpose. Each one exudes quality that has become a Sony trademark…as you handle and use these radios you feel confident and secure in the way all the buttons and controls feel and function. Alas, each of these radios is a bit pricey, especially when compared with new Chinese offerings from Tecsun and Degen some of which arguably offer more “bang for your radio buck”. But if you want the best, one of these two Sony portables may be your cup of tea. As I write this in July 2004 rumors are circulating about each being discontinued, and countries of distribution have dwindled in the past several years, but each continues to be available in the United States, while the SW77 is also available in Germany and the SW07 in the United Kingdom. Introduced in 1999 the SW07 is considered a logical upgrade to the still available SW100. Although the SW07 is a bit larger than the “totally tiny” SW100, it offers several upgraded features and performance in return. The SW07 is described as a Compact Portable at 9.1 ounces with batteries and is a tiny 5 3/8 x 1 5/16 x 3 5/8 inches. It is clearly aimed at the frequent traveler who is willing to shell out top dollar for a very small radio with all the bells and whistles, as well as much of the performance of the costlier SW77. In fact, the main strength of the SW07 is that it is uniquely adaptable for travel. 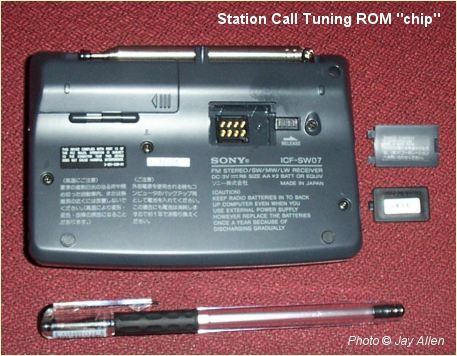 One of the biggest features for the world traveler is “Station Call Tuning,” which accesses a user-replaceable ROM (see picture) pre-programmed with broadcast station and frequency information arranged by Time Zone. This is a major step ahead of any other radio which comes pre-programmed with station frequencies. Here’s how it works. On initial setup you set your Local Time either by choosing a major city near you or by entering the actual UTC Differential from a table included in the manual. As you then toggle through various Time Zones the radio will seek a database of frequencies most likely to work for that area! You can even have fun searching through some of the frequencies for time zones other than your own. Your Local Time Zone also determines the AM channel spacing (9 KHz or 10 KHz). (One downside of this is that you must keep your radio set to Local Time while my habit has always been to display World Time, as that’s the system we use when listening to shortwave). Updated ROMs are available for $19.95 by mail order; new ones are available each October through F Corporation in Japan, which also produces the “Wave Handbook” which comes with all Sony world band radios. You can also obtain yearly updates of the printed book if you wish. The smaller-than-a-postage-stamp-sized ROM is loaded with frequencies covering most of the major world stations…far more than could be programmed into any other radio. You have dedicated buttons on the front panel for BBC, DW, VOA and in addition, “OTH” and “MY”. OTH (it stands for “Other”) toggles among five additional stations, including France, Japan, China, Spain and the Netherlands. Additionally, when you order replacement ROMs you can replace any or all of these last 5 stations and with selections from a list of 25 stations available. This is a great concept for keeping pre-programmed presets up to date and the sheer number of entries in the ROM database is impressive. The MY button accesses an additional 100 presets you can define; each can be alpha tagged with a 6 digit name. Finally there are 10 FM presets and another 10 for am/sw all with 1 touch selection and alpha taggable…another handy arrangement. The variety of tuning features alone makes the SW07 a truly unique portable, especially given it’s tiny size. One Negative: I just received my SW07 and it arrived with an already outdated chip. They are coded with letters, not dates, so you have to email F Corporation to see if yours is the most recent. However, I received a reply within 2 hours on a Saturday morning, with the short message. “You do not have the latest Chip. Please send $19.95″ etc. It seems that, for the price of the radio, you should expect to receive an up-to-date chip…I guess not. Other owners have reported that the ROMs arrive fairly quickly after ordering. Clever Design: The SW07′s speaker remains unobstructed even when the “clamshell” is closed. This makes it quite convenient to listen to while it is being carried, and you still have easy access to the volume control knob on the near right edge. The fact that the radio sits virtually flat on the desk, tilted back just enough to look snappy, makes it very stable and secure when punching buttons, while the LCD screen can be adjusted to any comfortable viewing angle much like a notebook PC…very elegant overall. This radio is a real eye-catcher and often elicits comments; even from non-radio enthusiasts, who appreciate its unique, high-tech design. Excellent Synchronous Detection: Another triumph for Sony. The sync behavior in the SW07 seems on a par with that of the SW77, and that’s good company to be in. It is easy to toggle among Sync Off, Upper and Lower as on the SW77. It locks onto anything but the weakest of signals, and seems to improve reception much of the time on both am and sw.
ANLP-2 Antenna: A Big Bonus. The ANLP-2 is included right in the box with the SW07. It is a special version of the well-known ANLP-1, which is an excellent loop for shortwave portables and sells for around $90 in the US. The essential difference is that the ANLP-2 is a dedicated design especially for the SW07…the radio completely controls not only the antenna’s On/Off functions but also frequency pre-selection of the antenna as the radio is tuned from one frequency to another. In fact, it’s even smart enough to turn the antenna off if you tune to am, lw or fm, although there is one inconvenience in that you have to unplug the antenna from the radio to listen to those bands. The ANLP-2 substantially enhances shortwave reception on the SW07 as you will see below. RF Performance: Best in category…well, yes, but you must use the ANLP-2 for this performance rating on sw. Then, reception is excellent. (See Comparison Section below). On the internal ferrite and whip antennas reception drops a notch, but is still amazing among small radios, and you’ve got that sync circuit which sometimes makes a big difference. However off the whip and ferrite bar on sw and am be aware that the SW07 does not match the reception of the 7600GR or the SW77…those larger radios are both more sensitive. Plus they each offer finer SSB precision with the SW77′s 50 Hz tuning increments and the 7600GR’s analog clarifier knob. However the SW07 does offer a variable attenuator which is welcome indeed. It’s especially useful for setting the “Scan Stop Sensitivity” when using auto scanning mode. Audio Performance: As you would expect the audio from such a tiny radio does sound tiny. However, Sony has done a good job of tonal shaping so the sound is more pleasant than many small radios which often sound more like kazoos than serious pieces of equipment, but for the best sound the included ear buds do a good job. FM is in stereo through earphones and the sound is full and natural. The SW77, which is the “heir apparent” to the legendary 2010, comes very close to matching its ancestor’s state-of-the-art performance, although the “personalities” and “feel” of them is quite different. Passport 2004 refers to the SW77 as today’s “best” portable and that alone is strong praise. The SW77 is a “lap portable” and weighs in at 3 ¾ lbs with alkaline batteries and measures 10 7/8 x 6 7/8 x 1 7/8 inches. SW sensitivity is superb with the whip, and although am sensitivity is not quite on a par with some of the best am dxing portables, it is quite respectable, especially aided by the dual bandwidths and excellent sync circuit. The SW77′s Wide mode is considerably less wide than in the 2010 so selectivity is excellent, and the Narrow filter is narrow enough for any sw listening and good for SSB as well. The addition of an external antenna such as the ANLP-1 for sw (which works very well even though Sony doesn’t recommend it for use with this radio), or any of several loops for am comprises a killer combination for excellent reception. SSB reception and repeatability are also excellent. You can preset a station such as AFRTS down to the nearest 50 Hz, including the USB mode, and pressing that memory preset brings the station in day after day with no re-adjustment needed. I have no other portable that possesses this capability and SSB reception is one area in which the SW77 is an improvement over the 2010. The SW77′s “Station Name Tuning” provides 162 memory positions arranged in a flexible page system which can help you arrange your presets in an easy to access way. You can also label each station with a 6 digit alphanumeric title. Interestingly, when the SW77 first was introduced, many described its page system is overly complex. But as radio technology (read “interface software”) evolved and radios started offering more and more functions and memories, several manufacturers adopted similar setups, and it is now considered typical for any radio with more than about 40 or 50 presets to have some system to organize them. To explain the 77′s page system as simply as possible, let me set up an example for the BBC. I will assume you are going to create your own BBC presets rather than relying on the factory presets, as factory presets are generally less than perfect for any one location and tend to become outdated because shortwave frequencies change so frequently. In fact, I ended up wiping them all out and starting from scratch, basing my presets on my actual reception logs. It took awhile to accomplish but the result is a very pleasant to use radio that really grows on you. You first scroll to an available page, let’s say, Page 1 of the 20 available pages. That first page can hold up to 5 “stations”, so you decide to make the first one BBC. Within that “BBC Station” you can preset up to 10 frequencies, and then label it “BBC”. Since I listen to the beeb quite a bit I set up two BBC pages with 20 frequencies total. When you later select that page, simply hit the BBC button and the radio will select the strongest frequency at the moment. Alternatively, you can program each of your BBC frequencies for certain time slots and the radio will select the best frequency based on time of day. You can also turn off each of these automated modes and simply step through the 10 frequencies manually to choose for yourself, but even when in one of the automatic modes you can still step through the frequencies manually if you’re not happy with the automatic selection. Another nicety is that the radio only displays pages that have stations on them so you don’t have to wade through empty pages to find the ones you’ve set up. An important note: Although you can store up to 20 pages with up to 5 stations on each page, and each station can hold up to 10 frequencies, you are still limited to a total of 162, but I think you will find keeping track of even that many presets takes time and determination. There are also two Quick Pages which have direct access and can be used any way you want. One suggested use is for temporarily saving new finds until you figure out what you want to do with them. Alternatively you can use them for you local AM or FM stations or just any combination of favorite frequencies you want to be able to access fast. FM performance: Very good. The radio exhibits little overload even in urban areas, and although it doesn’t compare with a serious dxing fm tuner, reception and sound quality (the radio has separate Bass and Treble controls) are pleasing. Audio Quality: The SW77 features separate Bass & Treble controls which is rare among world band portables. They provide an effective amount of control over the audio, especially on FM. However, for some listeners the radio sounds a bit muffled on am and sw due to the relatively narrower IF filters than some other radios. These filters are great for selectivity but I would have preferred a slightly wider wide filter for better sound quality. This is a subjective comment and is not shared by all owners of the SW77. Rod Antenna Flimsy: When the ’77 was first released it had a nine section telescopic antenna. It was soon replaced by an 11 segment antenna, and this antenna is the flimsiest I have ever seen on any portable radio. The last two sections are made of such thin material that many users keep the last 2 sections collapsed to prevent damage. I have owned my ’77 for several years and so far have not had any accidents with mine, but be aware of the fact that Sony Parts demands $68 for a replacement (ouch Sony)!!! Not a great comment about their attitude towards customer service. FM alignment issue: Many samples exhibit a bit of fm misalignment, meaning fm stations come in when tuned slightly higher or lower than their correct frequency. Actually I have seen this on several sw portables of late and I don’t know why this is so common…my guess is that world band portables are not perceived by their manufacturers to be used for fm other than casual listening to easy-to-receive stations, but I could be wrong. I have observed this on sw portables from several companies. Overload: I have observed limited examples of mild overload on nighttime sw signals here in the Northeast USA using just the built in whip antenna. This has only occurred on a few occasions and manifested itself as a second signal being audible beneath the desired signal. Each time I was able to eliminate the problem either by using the DX/Normal/Local switch or by shortening the rod antenna somewhat. It is unfortunate the SW77 does not have a variable attenuator (such as found on the SW07) but instead offers a 3 position switch. I sometimes use a 50 foot random wire during the daytime as well as an ANLP-1 and have not noticed any overload problem with either during the daytime, but would imagine in stronger signal areas this might become an issue unless an attenuator and/or pre-selector were used. (The ANLP-1 contains a pre-selector which is one of the reasons it is so well behaved with portables). Signal Strength Meter: This Bar Graph meter could have been useful as it contains enough elements to show several levels of signal change, yet it so grossly over reads that it registers full scale on just about anything you would actually want to listen to. It looks impressive but would be more useful if it were calibrated differently. SW77 vs. SW07: I ran side-by-side comparisons of the two radios over a several day period. The larger SW77 was both more sensitive and more selective than the SW07 across the board on am and sw stations. FM reception seemed virtually identical. (By comparison, the 7600GR was firmly in the middle of the two as you might expect). However, when I added the ANLP-2 to the SW07 it now matched the SW77 (on its whip antenna) on shortwave overall. Interestingly, they performed differently at different frequencies. The SW07/ANLP-2 actually beat out the SW77 at higher sw frequencies, such as 15,000 KHz, 15190 KHz and 15400 KHz. The two were too close to call at 10,000 KHz, and the SW77 beat the SW07 at 6070 KHz and 7490 KHz. Lab tests would probably reveal a staggered relationship between the two, where-in either one could be more sensitive than the other at a particular frequency, as the relative sensitivities of both the SW77 and the ANLP-2 antenna vary as you scan frequencies. But overall they are so close that they can be considered comparable for all intents and purposes. On direct comparison the beefier SW77 clearly does outperform the SW07 in other ways. It displays superior sensitivity on am, offers dual bandwidths and more powerful audio. If you are going to have one radio, and you don’t fly in airplanes or stay in hotels often, the SW77 will probably please you more. If you want a protective carrying bag check out the one from Universal. I use mine for all my larger portables. But if you are a frequent flyer or hotel patron the SW07 has it all over the ’77. It’s less than a quarter of the size and weight even with the included ANLP-2 antenna; it instantly adapts to any time zone and accesses a huge database of yearly-updateable frequencies. Using the ANLP-2 and you’ll hear more in your hotel room without having to sit right at the window…very deluxe indeed. Price: Sony’s top portables have always commanded premium prices and these two models are no exception. The SW07 was initially listed at $419.95 but is now listed at $399.95. A web price search revealed many places offering it for $340 to $360. The SW77 lists at $469.95 as reported in the 2004 Passport, but the Sony Style website shows it as $579.95! Other sellers are listing it at $500 to $530 so it would appear the radio is selling closer to its official retail price than previously. Occasional refurbished SW77′s from Sony are available for around $300 to $340. 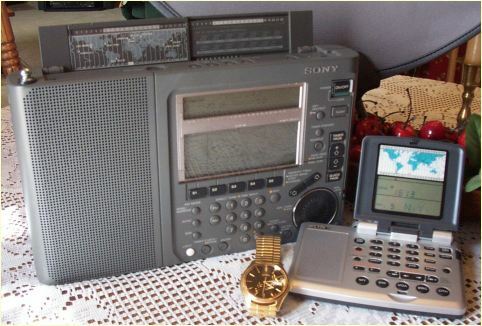 (I recommend refurbs from Sony and Grundig as being a good way to get a tested radio at a great price. My experience with several Sony and Grundig refurbs over the years has been 100% positive. Each of the units I tested appeared new with no signs of previous ownership other than the box and operated perfectly). Unusual ANLP-2/ANLP-1 Note: As I mentioned I’ve used the ANLP-1 successfully for several years. The ANLP-2 provided with the SW07 is a modified ANLP-1. It appears identical in all respects except that its control box lacks an on/off switch and a frequency range knob as those functions are controlled automatically by the SW07. I was stumped, however when I tried to fold up the ANLP-2 for the first time…I couldn’t do it! Try as I might I couldn’t get the loop to collapse into its compact size and snap together…a problem I never had with the ANLP-1. I compared the two antennas together and discovered an interesting thing. They are indeed identically designed from a mechanical point of view, yet when I tried to fold them up they did not fold in the same way, as if the inner wiring had different rotational stresses. It’s difficult to describe, but basically, there appear to be two ways it can fold, but only one of them is the “right” way. I was able to force the ANLP-2 to fold as my ANLP-1 does, but I now understand why some ANLP-1/ANLP-2 owners have had such a tough time folding their antennas while others said, it “just folds up with no problem”. As you bend the open loop into a figure 8 configuration you end up with three loops from the original larger single loop, and you must be sure they fold together in the right sequence. In short, with one of these antennas it folds automatically every time. With the other I must force it into the correct shape for it to fold properly. I don’t think this is a difference in models…I think it is a sample-to-sample issue, so if you have trouble folding your ANLP-1 or 2, try gently forcing it into a different configuration. Don’t force it enough to permanently bend it, which I have read reported by at least one user. Conclusions: I came away from the comparison of these radios very impressed with each one overall. I feel that each is the best example in its class and that they don’t’ actually compete with one another…they are for two extremely different kinds of use. For sw performance, the SW07 with its included ANLP-2 antenna virtually matches the SW77 for sensitivity. It’s as good as it gets in sw portable performance. The SW77 does offer dual bandwidths for more control over tough signal situations, is somewhat more sensitive off the whip and is more sensitive on am. For travel flexibility and phenomenal “gee whiz” factor the SW07 is the ultimate compact. It outperforms every other compact when used with the ANLP-2. You also have to accept the fact that a tiny radio with a tiny speaker will sound tiny. 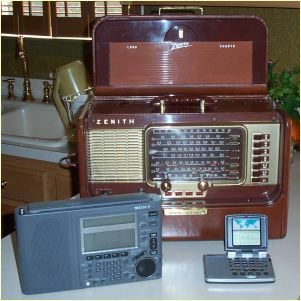 If you are listening at home for long periods of time it certainly will not be as pleasing to listen to as the larger SW77, but for the serious traveler it’s the easiest way to bring your shortwave with you. And finally, that replaceable ROM is a feature that no other radio at any size or price offers. *Sync Note: I have read many discussions of the pros and cons of sync reception as it is implemented in various manufacturers’ designs. The consensus is (and I agree) that a well-designed sync circuit can provide substantial improvements in two ways. First, by substituting a stable, internally generated carrier frequency to replace a fading one, the “Selective Fading” effect of gross distortion can sometimes be dramatically cleaned up. Also, the ability to choose either the upper or lower sideband adds substantially to selectivity because you can ignore whichever sideband is receiving interference from an adjacent frequency. The effect is more than dramatic. Both the ’07 and ’77 have sync circuits which work extremely well, and you will find many instances where engaging the circuit will make a very bad signal sound very good. August 24, 2004 First you should email them at: fco@wavehandbook.com . (F Corporation also publishes the printed Wave Handbook which comes with Sony sw portables. Yearly updates are also available for the printed book). They will then email you back with an order form which gives you the address and also lets you choose your custom stations if you do not want to accept the standard stations.